Note : The AAC-1000 has 2 RS485 ports. If you haven't already done so, download and install a copy of the CBMS Studio Engineering Tool. If you do not have a CBMS device, download and install the Windows Software bundle which will run as a Windows Service identified as localhost. Available devices are listed in the tree of the engineering tool by their IP address or computer name. If the device is not in the tree then select File - Open to initiate a connection. 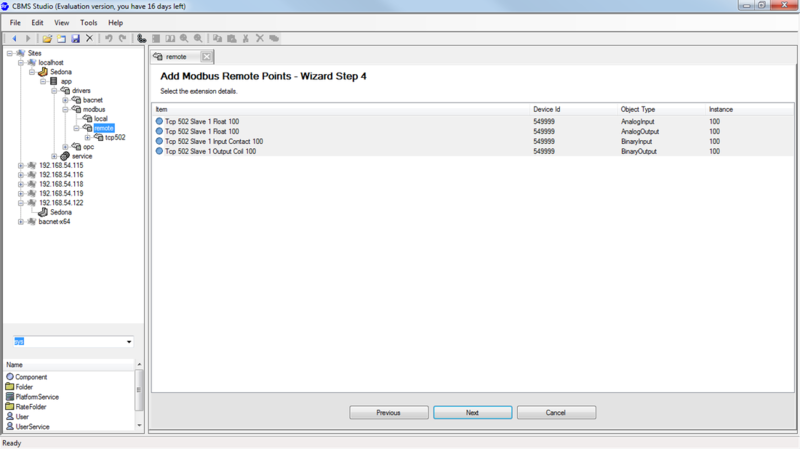 Navigate to Sedona-app-drivers-modbus-remote. This folder will contain the Modbus TCP or RTU ports for connecting to Modbus Slaves. By default there will be no ports in these folders, they will be created when points are added to the device. To start adding points, select the Add Points button at the bottom of the page. 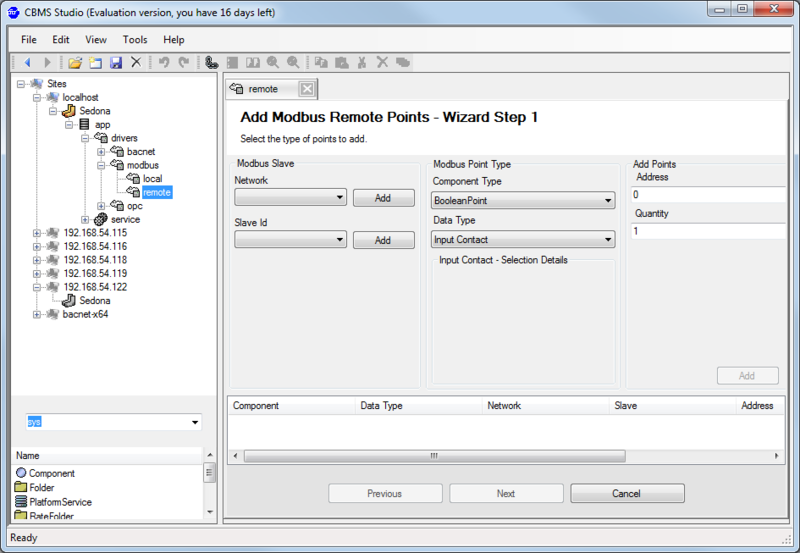 The Add Modbus Remote Points wizard will be displayed, and from here we need to select a Modbus Port and Slave device. If the Network dropdown list is empty, then a new network needs to be added. Click on the Add button to add a new Modbus TCP, or RTU network and then click ok to add the new port, a slave will automatically be created at this point. 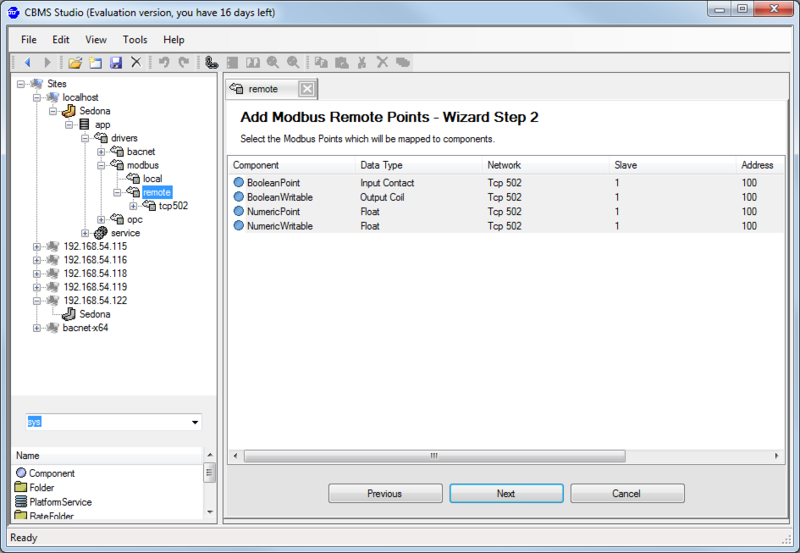 Modbus points are first mapped to Sedona components of type, NumericPoint, NumericWritable, BooleanPoint or BooleanWritable. The modbus address, data type, register type and byte order needs to be selected for each modbus point that needs to be added. In this example, we have selected 1 component of each type and added it to the list. Once all of the points have been added, select the Next button to continue. You can review your selection from the Wizard Step 2 page and then select the Next button to continue. 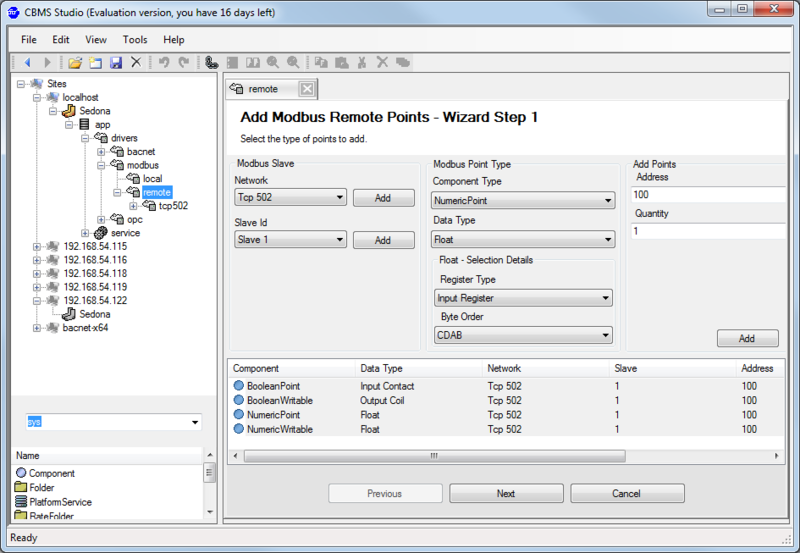 To map the modbus points to BACnet points we create a BACnet extension for each of the modbus components. 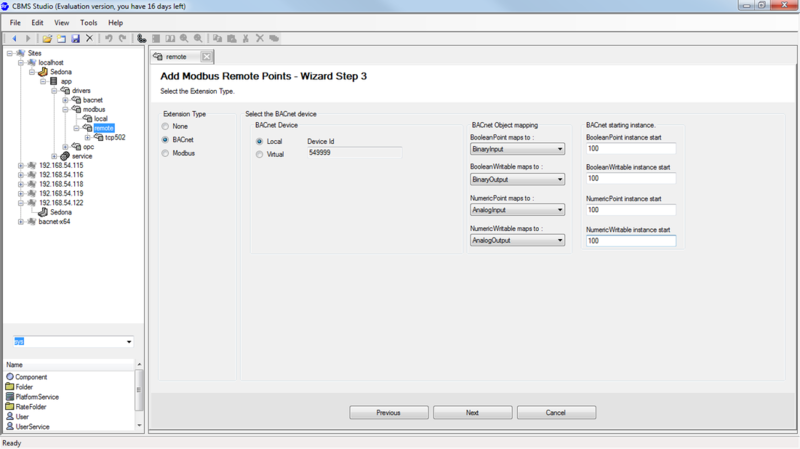 Select the radio button for BACnet and then select the device for adding the points to. 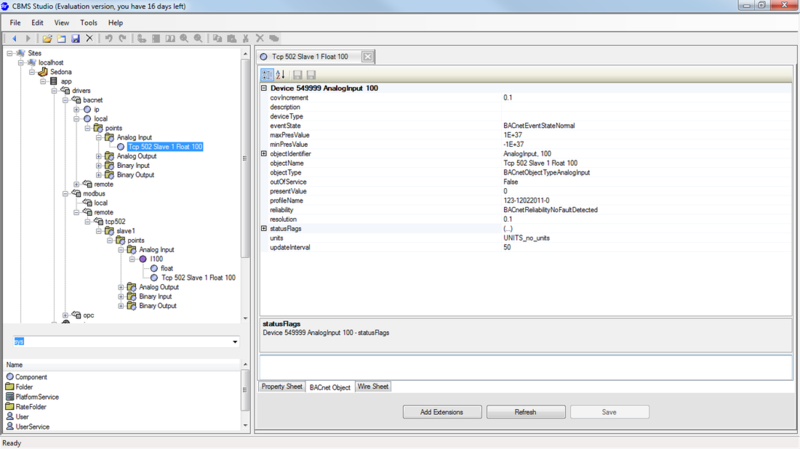 Virtual devices are supported if you want to create multiple BACnet devices, but for this demonstration we will add them to the local device. You can also select a starting instance number for the BACnet objects. Click next when you have finished making your selections. Review your selection from the Wizard Step 4 page and if everything looks correct select the Next button to continue. 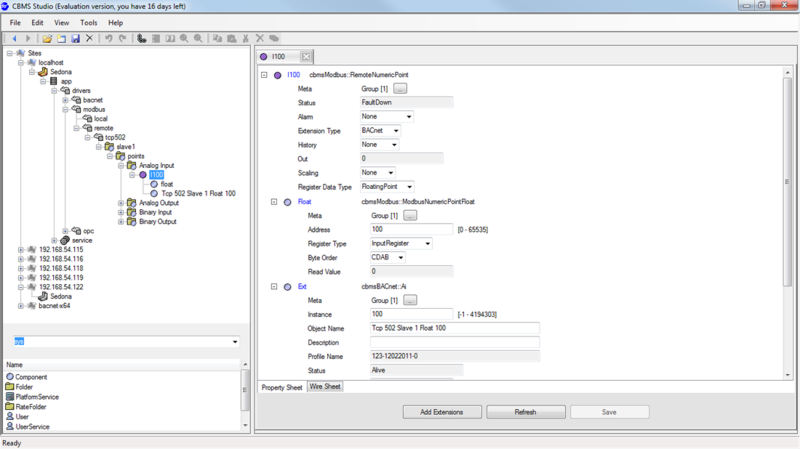 The Modbus components will appear under the Modbus Slave device as shown by the screenshot on the right, while the corresponding BACnet object will be visible under the BACnet local device. 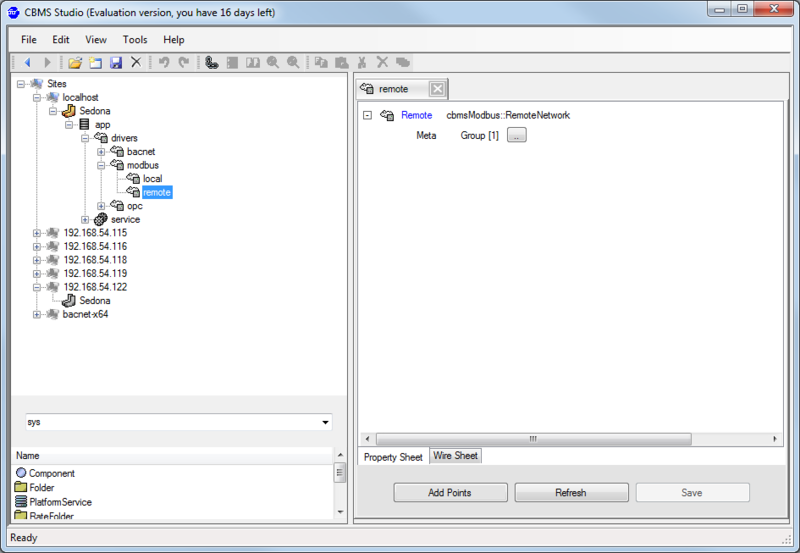 The BACnet points can be viewed from any BACnet client connected to the network.